Calling it a Mother’s Day gift for Johnson’s mother, Pilato started painting at 3 a.m. Sunday and worked through the morning on Johnson’s image on his “Inspiration” mural. Johnson played football at North Allegheny High School and was a proud Lion Ambassador during his time at Penn State. He fell down at the 12-mile marker of the Pittsburgh half marathon last Sunday, just 1.1 miles away from the finish line. It was later discovered that Johnson had had an rare abnormality in his coronary artery system. Johnson was working at Deloitte & Touche and had just finished his first of four tests to become a Certified Public Accountant. His father mentioned to the Pittsburgh Tribune-Review Kyle had recently run a similar race in New York but had no prior health problems. Johnson was loved by his family, his friends, and especially the Lion Ambassadors. He served as the Director of Internal Relations during his senior year and always knew how to put a smile on someone’s face — whether it be a fellow L’Amb or a wide-eyed student on a tour. Indeed, there are undoubtedly countless students at Penn State today because of Johnson’s campus tours. “With the addition of Kyle, we hope that the mural will allow the Penn State community to remember Kyle as the great Penn Stater and the great person he was, as that is how he will be remembered by those within Lion Ambassadors,” said John Satira, the president of the Lion Ambassadors. Pilato sent the following message to Johnson’s mother and had the note posted next to him all morning and afternoon while he painted to give him inspiration. “Today is Mother’s Day. It is 3 a.m., and I am on my mural painting your beautiful boy Kyle Chase Johnson. I wanted you to have this gift on this day to honor you and all mothers who have gone through the agony of loss. Your boy was a great young man who touched so many in his short but productive life. “So many students that I know and ones I do not know have told me about him since the news of my adding him to the mural. Kyle was a remarkable young man. He seems to me to have been a charmer who always left a wake of smiles. People could live many lives over yet I believe they would not gift as many smiles. He was a role model. “My mural in State College is called Inspiration. Every one on it has inspired me in one form or another. Kyle has inspired me with the most inspirational thing of all and that is love. That love I saw in the faces of students, and it will not go away. Love does not disappear; it is engrained in our hearts. “To all the moms I have painted — my mother, my daughter’s mother, Sue Paterno, and the mothers of our super heroes who left us too early, like Kevin Dare, Brandon McCumbee, Cordell Logan Page, Kyri Hall, Isaac Thomson and Ryan Ostrom and now Kyle Johnson, to the mothers of Sandy Hook and the Boston tragedy, to the moms around the world who suffer this sorrow, I paint Kyle for you as well. “Happy Mother’s Day, Mary Beth you truly are a great Mom. 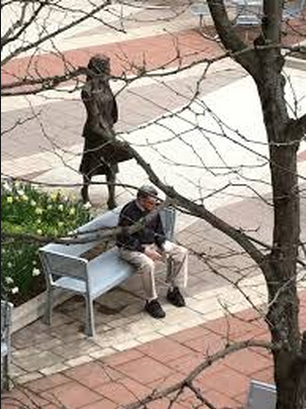 Next to Johnson, Pilato painted the iconic photo of Joe Paterno eating ice cream alone on a bench outside the Berkey Creamery. Few loved Penn State as much as Johnson and Paterno’s photo is symbolic of that love. A flower is placed on the bench next to Paterno, as well as in Johnson’s hand, to symbolize mothers and Mother’s Day. Additionally, Pilato has added space below and around Johnson for his friends and family to add personal message and share stories. The family is asking that memorials be made to Penn State University, to benefit the Lion Ambassadors, in memory of Kyle Johnson, 1 Old Main, University Park, PA 16802. Our thoughts continue to go out to Kyle’s friends and family during this difficult time. Kevin Horne contributed to this report.